The third quarter of 2018 witnessed a continuous growth of China’s healthcare sector, mostly driven by the online healthcare segment. The growth was attributed to increasing demand for quality healthcare, stimulated by the country’s strong economic performance, rising incomes, expansion of the middle class and ongoing urbanization. Total spending on health and family planning reached RMB 329.3bn in Q3 2018, up by 2.6% y/y. The government pressed on with the structural reform of the healthcare sector and focused on improving cooperation of medical institutions and better integration of medical resources. In Q3 2018, the growth of healthcare and medical services costs continued to slow down of increased government funding of the healthcare sector and of the continuing upgrade of the country’s insurance system. Stimulated by growing market demand for customized healthcare products, medical insurance further opened up to private investments. 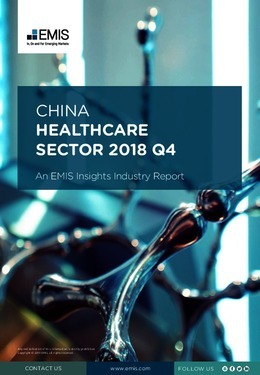 This report provides a complete and detailed analysis of the healthcare sector for China. EMIS Insights presents in-depth business intelligence in a standard format across countries and regions, providing a balanced mix between analysis and data. Build a clear picture of trends and issues for sub-sectors (e.g. medical institutions, medical devices and pharmaceuticals).